Sangerfest, meaning singer festival, is a competition of Sangerbunds, or singer groups, with prizes for the best group or groups. Participants number from the hundreds and thousands, and the fest is usually accompanied by a parade and other celebratory events. The sangerfest is most associated with the Germanic culture. Its origins can be traced back to 19th century Europe. In Europe the sangerfests had a political aspect. European immigrants brought the tradition , in non political form, to the North American continent. In the early part of the 20th century, sangerfests drew crowds in the tens of thousands, and included some united States presidents among their audiences. When Newark, New Jersey hosted the 21st National Sangerfest, held on July 1-4 1906 in Olympic Park, 25,000 people showed up to hear the music, many arriving in chartered trains. Only a few thousand were able to get in the hall, and 2,000 were standing. Five thousand singers from more than 100 sangerbunds representing forty cities from New Jersey, New York, Maryland, Pennsylvania and Delaware competed for a $20,000 prize offered by Kaiser Wilhelm II. Park vendors offered souvenirs, refreshments, games and a carousel. The post card , illustrated here, is from the 1906 Sangerfest. 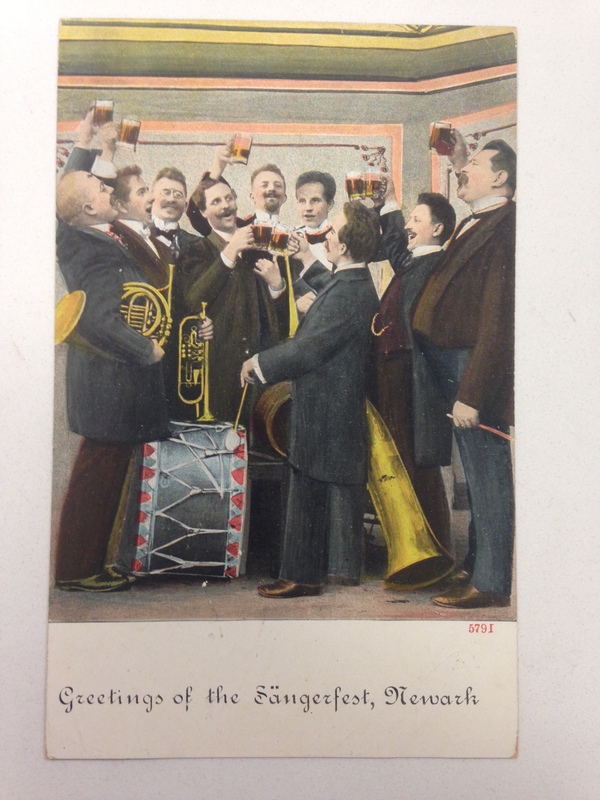 Postmarked from Newark, the sangerfest undoubtedly drew many attendees from Newark which had a substantial population of German descent.